For just the third time in my life I have opened the case of a typewriter and instantly said to myself, "I am never going to touch that typewriter!" In 55 years, I reckon I must have opened the cases of way in excess of 3000 typewriters. The one I opened at 3.30 this afternoon presented me with a one-in-one thousand moment. The typewriter came from Derrick Brown in Brisbane. It is a Corona 3. It is one of the two most immaculate old typewriters I have ever seen. At 4.30 on Sunday afternoon I sat here watching the auction for this typewriter come to an end. I hadn't planned to bid, though I had been looking at this item for a week and was sorely tempted by the price. It had stayed at the starting price of $200 most of that time. With 3 1/2 hours left, someone finally put in a bid. I wasn't sure I could beat it. I was far from sure I wanted to. "Do I need yet another Corona 3?" the rational part of my brain kept asking. "Can I afford $200 for another typewriter?" Meanwhile, the other 7/8ths of my brain, the typewriter-loving part, kept replying: "Go on, bid. One last Corona 3 before the centenary of the Corona 3 ends. Plus you don't have one with those panels. And, after all, it's Derrick Brown. It'll be in beautiful condition." Beautiful, did I say? This Corona 3 is beyond beautiful. It is beyond sublimely beautiful. Mere words cannot do it justice. Ray Nickson commented the other night, "And yet a gorgeous Corona 3 sold on Australian eBay today for only $202.50 - if only I had been in a position to bid!" Ray repeated these words the next day when he called me. "Well, Ray," I said. "It's now mine!" "You won it!" said Ray. "Well done." He doesn't know the half of it. He will tomorrow when he arrives here and sees the Corona 3 in the flesh. His breath, like mine today, will be taken away. The first time this happened to me was when my gold-plated Royal Quiet DeLuxe arrived from the Vintage Typewriter Shoppe in North Carolina. Six years later, I am starting to be able to look at that typewriter and not feel so weak in the knees. In 2007, I had some success in an online auction for the estate of a Chicago typewriter collector. These included a Blick 8 and 9. But the real surprise came with some "surplus" items I picked up. When I opened one case, I was left absolutely speechless. Inside was a 1938 Underwood Champion which quite evidently had never been touched. It remains pretty much that way to this day. It still makes me feel faint when I look at it. The gold-plated Royal is very occasionally touched, but with considerable reverence. This Corona 3 ... I don't think it is ever going to leave its case. In his item description, Derrick had said the Corona 3 was in "fabulous condition". That was unquestionably one of the droll Derrick's classic understatements. 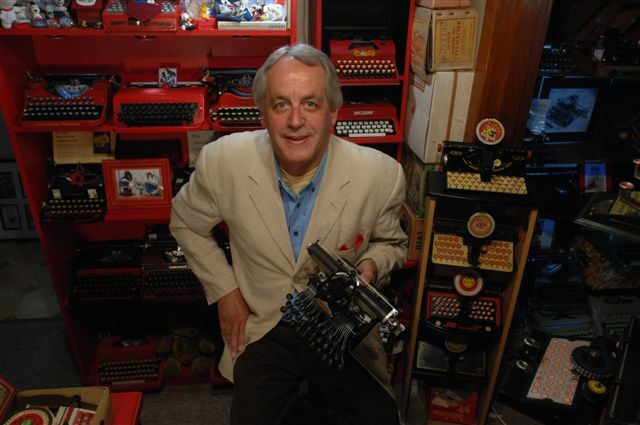 I have now bought many typewriters from him: A New Yost, a Noiseless portable, a Hammond - in the past year or so alone, as far as I can recall, a burgundy Corona Silent, a Standard Folding-made Corona 3, last week an Olympia Elite. All have arrived in superb condition. But none could match today's surprise package. "The paint ... has a mirror finish," Derrick had said. "The chrome is also in great condition ... Although I restore these typewriters I never repaint or touch up the paintwork. Nor do I use abrasives, so what you see is original factory paint. All the mechanical features are working well and I have installed a new ribbon ... This typewriter would look great in any setting and what a Christmas present." Did I say understatement? Thank you Derrick. This is the best Christmas present I could ever had picked for myself. PS: For once I am more than happy to apologise for my inept photography. These pictures simply do not do this typewriter justice. Yeah, I was watching this machine myself. I just didn't have the spare change this week to put some cash down on it. Excellent, and beautiful machine! I really should contact DB sometime. What a spectacular machine. Congratulations again on winning the auction. I can't wait to see it 'in the flesh' (but from a sensible distance of course - I don't think I'd even feel comfortable breathing near such a perfect looking Corona 3). It's better that you got it than me. My hands would be on it like Hefner's on a bunny. I was just typing on my 1923 Corona 3 the other day. Fabulous typer. So snappy! It's a shame, in a way, that you are saying that you won't give this machine a spin. But on the other hand, I understand your desire to keep it pristine. I'm stricken by the way you mastered this topic. It isn't often I come across a web site with charming articles like yours. I'll note your feed to keep as much as date along with your hereafter updates. I like it and do carry on up the excellent function.